Last December we told you that the Cabildo of the Cathedral of Santiago had decided to start granting also the compostela to all the pilgrims that cross the Camino from A Coruña through the English Way. Until that moment it was impossible to obtain it, due to the requirement of having traveled at least 100 kilometers to Santiago de Compostela. Impossible, as we say until last December. Precisely this Saturday the Office of the Pilgrim has issued the first two compostelas to two pilgrims, who have begun their journey in the Romanesque church of Santiago in A Coruña. The Coruña residents Montse Bouzas and Manuel Pazos have been surprised when arriving at the Cathedral of Santiago have obtained the document, after traveling 90 kilometers in four stages. 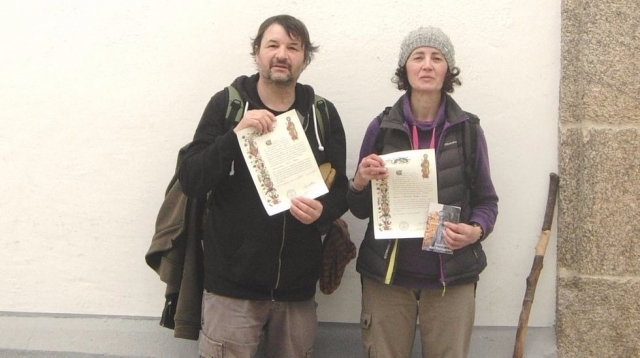 The two pilgrims have followed the official route of the English Way published by the Xunta in 2014. Not only the pilgrims who depart from A Coruña can request the compostela. Even without having covered the 100 kilometers established at least, the pilgrims who arrive at the port of A Coruña will also be able to obtain the document only certifying that they have been part of the Camino in their regions of origin. This decision certainly gives a boost to the already attractive English Way, which can also be started from Ferrol.